Pictured from left are Principal Bray Shamblin, Jeff Fowler, Kyle Northup, Rick Howell, Henry Dillon, Jim Ryan, Buzz Call, Richard Brown, and Jared Ward. 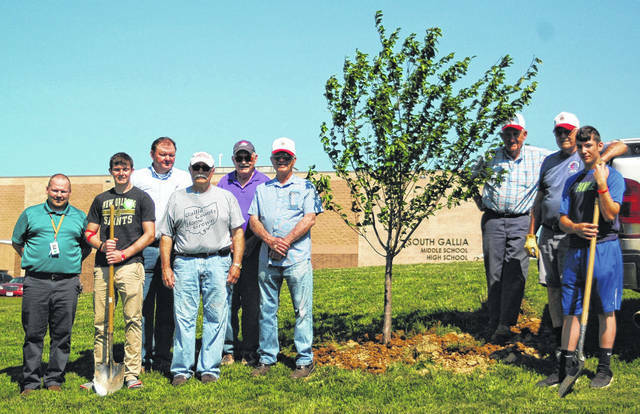 GALLIA COUNTY — Gallipolis Lions Club members have been out helping the environment and supporting local schools. Last year the Lions Club agreed to plant two trees a year at each high school for three years to help create a positive ecological impact and improving the aesthetic appearance of the schools. The work is all done by volunteers from the Lions Club and members of the schools. At South Gallia, two students from the agriculture came out to assist with the planting. “I really like helping out in my community,” said sophomore Kyle Northup. Each school was allowed to choose what species of tree they wanted to have planted. South Gallia chose Japanese Cherry, while River Valley selected White Dogwood and Gallia Academy went with Red Maples, which turn a bright shade of red in the fall. The entire project is funded by the Lions Club as an opportunity to fill needs and give back to the community and improve the new schools with external upgrades. This marks 12 trees planted in two years for the Lions Club at the high schools, with six more set for next spring.